The capital city of Western Crete is Chania, the most beautiful city of the island and, as many say perhaps of whole Greece! It is the capital of the prefecture Chania, a prefecture known for its stunning nature with high mountains, deep gorges, beautiful beaches and many small picturesque villages.Visit our Chania listings to discover exceptional accommodation and entertainment destinations. Agios Nikolaos, Crete. Make the most of your holiday and discover with us the wonders of Crete. Explore the Cretan mountains by arranging a jeep safari to discover the authentic rural setting and agricultural lifestyle. On the other hand, arrange a dive into the outstanding clear waters, a playground for divers, or a sailing cruise to the various natural and historical sites, such as the Chrissi Island or the so called “lepers’ island” of Spinalonga. 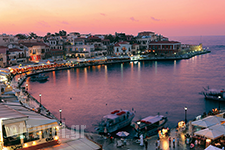 Visit our Agios Nikolaos, accommodation and restaurants listings to discover more. 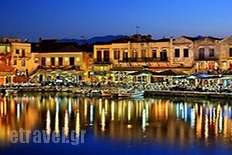 Rethymno with the colors of the Renaissance! Rethymno with the well-known place of Psiloritis and the blue sea, with traces of civilization that was here about 4,500 years ago, with numerous monasteries and Byzantine churches, Venetian monuments – is the best preserved Renaissance city with endless beaches, caves, canyons and unique flora and fauna that is waiting you for discover them all! Visit our Rethymno listings to discover exceptional hotels and restaurants. The birthplace of El Greco and Nikos Kazantzakis, Heraklio is perhaps Crete’s most underrated destination. Sure, if you arrive with a tranquil Greek holiday in mind, Greece’s bustling fifth-largest city can initially be an assault on the senses. But although it’s not pretty in a conventional way, Iraklio can grow on you if you take the time to wander its backstreets and explore its nuances. Explore our Heraklion, Crete hotels and restaurants and make the most of your travel. Mykonos is the great glamour island of Greece and happily flaunts its sizzling St-Tropez-meets-Ibiza style and party-hard reputation. The high-season mix of hedonistic holidaymakers, cruise-ship crowds (which can reach 15,000 a day) and posturing fashionistas throngs Mykonos Town (aka Hora), a traditional whitewashed Cycladic maze, delighting in its authentic cubist charms and its chichi cafe-bar-boutique scene. 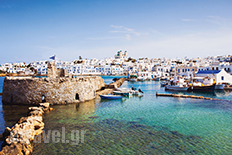 Visit our Mykonos listings to discover exceptional accommodation and entertainment destinations. Sandorini is one of the top destinations for holidays all over the world, thanks to its genuine beauty and volcanic landscapes. If you are looking for a place of unspoiled beauty and unparalleled romance, Santorini is the top option for you. Visit our Sandorini listings to explore its historic past and wander through its cobbled neighborhoods, mingling with the locals and tasting traditional delicacies. Simplicity and beauty shine brightly on this beautiful island. Looking around at the hills and villages, we feel as if a great modern artist outlined them, with slopes and inclines illustrating the poetic design. Paros radiates the light of the sun and reflects the beauty of the deep blue sea.The wind, the creative conductor and postman of sound, on land and at sea, carries the music from the hills to the valleys, from the reeds in the wetlands to the narrow cobblestone streets of the villages. Discover magnificent hotels are restaurants in Paros. Welcome to Rhodes, the capital of the Dodecanese, an island which is ideal not only for those who want to relax but also for those looking for an action-packed holiday! With its bright green hills, rich green valleys and uninterrupted line of golden beaches, Rhodes is truly a blessed place. Discover Rhodes excellent facilities for tourism, the island’s special blend of cosmopolitan and traditional, and numerous cultural and archaeological sites and you’ve got the perfect holiday destination. Karpathos holds its past close: in its ancient acropolis, caves, churches and even its traditional dress. The setting is more than dramatic: stunning vistas from untouched, mountain-clinging villages that keep vigilant watch over the Aegean, despite being hammered by ferocious winds. In Karpathos you’ll discover an island with its Greek soul intact, exceptional hotels-restaurants, living traditions, real people, local musicians and mythic festivals – untarnished by modern fads. Halki.The tale of the silenced clock tells you everything you need to know about this Dodecanese island. 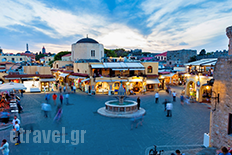 Small, quirky and totally enchanting, it’s an hour or so from Rhodes in real time, but light years away in character – a wonderful scrap of magic set in the sparkling Aegean.Not much developed in tourism, this is a perfect destination for peace and privacy. 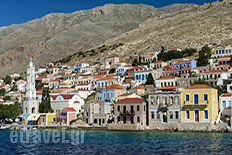 Explore magnificent accommodation and gastronomic destinations in Halki by visiting our extensive accommodation and restaurant lists. 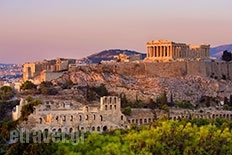 Athens, one of the world’s oldest cities has many stories to be told; well acclaimed or yet untold, ancient or contemporary, dazzling or out of everyday life, seasonal or all year around, contrasting and yet matching. This one city of never ending stories is unfolding right before your eyes, in short, crisp and unexpected narratives. Imagine yourself as being one of the characters, part of the plot or simply a light traveller. It all happens in one city that you have to read it to believe it. Visit our extensive listing to make the most of your visit in Athens.